The first time I saw a new mother eat her placenta was when I was 7 years old. My dog Cha-Cha had just given birth to 6 puppies, and without hesitation, she gobbled down the afterbirth. I can still remember the look on her face. She didn’t eat it for pleasure or because she was hungry. Her instinct told her she HAD to do it. God has a plan for a healthy recovery from birth for us mammals, and my chihuahua was following it. The placenta is a fascinating organ: http://en.wikipedia.org/wiki/Placenta It provides life and nutrition for the growing baby, everyone knows that. But not everyone knows what the benefits can be to the postpartum mother. 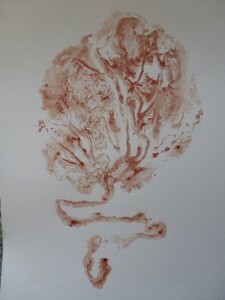 My first doula client who consume her placenta was a oriental medicine practitioner. I didn’t even know she was planning on preparing it. When I went to see her for her postpartum visit, I was amazed at how good she looked! I had never seen a mother so vibrant. She was the first mother I experienced who had benefited from her placenta. Then a year later I had a second time client who had a very rough postpartum experience the first time around. 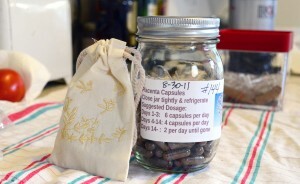 I encouraged her to look into placenta encapsulation for this upcoming birth. Her postpartum experience was completely different while taking the placenta capsules. With her first baby, she had problems with her milk supply, energy levels and had bad depression. Now, taking care of a new baby and a toddler AND taking exams for nursing school, she was radiant. She had abundant milk, lots of energy and felt great! I was sold. For thousands of years, the placenta has been used to avoid postpartum symptoms such as: depression, low vitality, fatigue, insufficient lactation, and hormonal imbalance. an increase in postpartum iron levels. First of all, you need to make sure you are able to obtain your placenta from your chosen birth place. Some hospitals just hand it to you, others want it to go to the lab for testing first, and yet others deem it bio-hazardous waste and refuse to let you have it. I can give you tips on how to best store and transport your placenta. Placentas have a “shelf life” and should be prepared within 72 hours of birth. if this is not possible, the placenta can be frozen and prepared at a later date. I can prepare your placenta in your kitchen or mine. (Some dads want to skip the experience all together. They are usually the same dads that stay “north of the equator” during birth.) Either way, I use all my own equipment, everything sterilized with a diluted bleach solution after every use. I prepare the placenta following the Traditional Chinese Method (TCM). (Eastern medicine has been using the placenta as a healing medicine for thousands of years!) The placenta is drained of blood, rinsed and then steamed in a pot with lemon, ginger and green chili. Once it is steamed, it is thinly sliced and placed in a dehydrator for 8 hours. Once it is thoroughly dehydrated, it is ground into powder and put into gelatin or vegetarian capsules. Placentas vary in size, so the total amount of capsules that a placenta can yield can be from 80-120. The number of capsules is always perfect for that mom, because she made the placenta.